After hearing wonderful comments on CoverGirl Eye Enhancers 4-Kit Eyeshadow Drama Eyes, I was actually compelled to buy it by a friend of mine who is a big fan of it. I am happy that I listened to her and bought this amazing eyeshadow kit which has surely made my eyes looked prettier and sexier. So here is my review on CoverGirl Eye Enhancers 4-Kit Eyeshadow which spills the best of the details about the product. As stated by the brand, this is a beautiful collection of great eye shadow shades that have been handpicked by our makeup pros and designed to make your eye look go from day to night. They blend effortlessly to bring your eyes out beautifully, without overshadowing. Experiment using them together or as single shades. 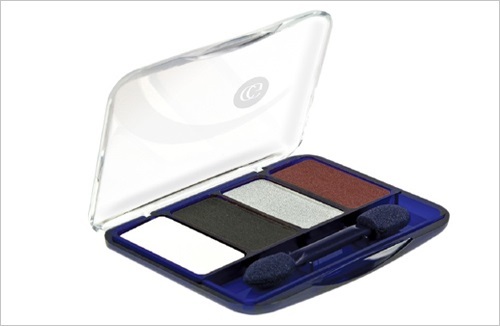 This eyeshadow kit is a small and compact packaging which comes in a white pallet with a transparent lid. It is a simple, easy to use and travel friendly packing which be very easily carried around in your bag. It comes with a dual-ended sponge applicator of decent quality for an effective and easy application. I quite liked the packing, nothing fancy about it. White: This is the very first color which comes with fine gold shimmers. Truly it is quite an innovative shade which a hint of golden shimmer in it. It is perfect to highlight your brow bone and inner eye duct area. I quite liked it. It’s unique and impressive. Black: This is a soft shade of black, again with gold shimmers for glamorous look. I loved the color; it is gorgeous and apt for elegant smoky look for your eyes. Shimmery Silver: This is a simple silver shimmer meant to be used in the inner eye duct area for highlighting. Cranberry: This is a wonderful twist which completes the pallet. It also comes with gold shimmers. It is ideal to create drama eyes for parties or wear a smoky look. Thumbs up for the color pallet, it’s classy and smart. Except black, all other shades have quite a decent pigmentation. You need a few swipes for black color to get a desired pigmentation. The eyeshadow is in a powder form and is very soft and smooth. You can easily have it on your brush and blend the shades for perfect eyes. The shades promise a satin finish and the gold shimmer is quite subtle and classy. This easy to spread and quick to settle texture is perfect for party eyes. I wore it to a party recently and it lasted for 5 hours without any fading. I am truly impressed with it. I also wore it with a primer and I was surprised to experience that it lasted for almost 8 hours. Wonderful power to stay!!! Stays long, even without primer. Well there is nothing specific about this pallet which I did not like, I would surely repeat my purchase.